The preparation for our short holiday visit to our friends Salvador and Dianne, who serve the Lord as missionaries in Kwa Zulu Natal, went ahead with great excitement. 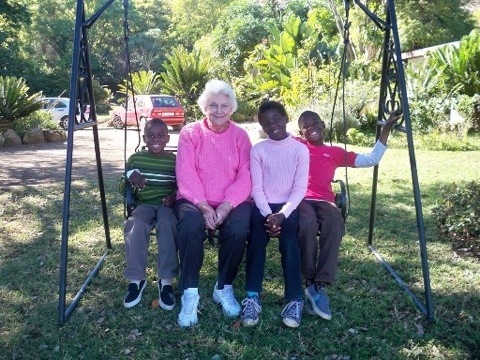 Our last visit in October 2009 was by 6 of the children and me, but this time all 11 children and our very dear friend Lilian, 78 years of age and who has been a close and active friend to Bezaleel from its inception, accompanied me while Allen held the fort at home. He put in a ceiling and painted a 3×3 metre wooden shed we had installed to house our library and one of the pianos for practising on, as collectively many hours of practise are required for the 3 children who play and it is disruptive to our other lessons. On our return home we have been busy with the mammoth task of moving the books into the library before our 3rd school term starts, which has created so much more space for us in the house. But getting back to our trip. Lilian came to stay a few days earlier to prepare, with the help of Lizzie and Thoko, our ‘padkos’ (food for the road in Afrikaans) and goodies for our teatimes. The day finally dawned and early on Tuesday morning of June 27th we hit the road, the H1 jam-packed with children and luggage. Our trip there and back went smoothly for which we thank the Lord. The drive takes about four and a half to five hours one way. On our arrival in Vryheid we met Salvador and Dianne at the local Baptist church where we had the opportunity to meet Jannie the pastor of the church and George who lives on the property and takes care of it with his wife Kogie. We had lunch, fellowship and prayer together then shopped for a few supplies before following Salvador and Dianne home to the kraal, which is about another 40 minutes away. On our way we made a short stop to visit Celani, Phumulani’s sister and her children. It was lovely to see her again. She has a well cared for home and is very industrious and her vegetable garden is always an inspiration to me. On Sundays Phumulani, Salvador, Dianne and the people meet at Celani’s home for their church service. 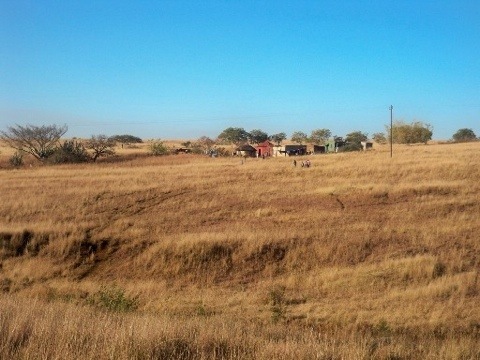 Celani asked after Clayton our son and his then fiancé and now wife Jessie from the UK, who had visited there in April 2011.Celani served us refreshments and after the children kicked the ball around a bit we piled back into the vehicles and set off for the kraal. Quite often during our stay some of the children would ride on the back of the open bakkie (truck), which was huge fun for them. The head of the kraal is Phumulani’s mother, Gogo. With her is Phumulani and Thabi his wife whom we met for the first time. Her granddaughter Bhabakeli, who has a little boy Asimbonge (who couldn’t wait for our visit) and a baby daughter, as well as Salvador and Dianne live at the kraal. 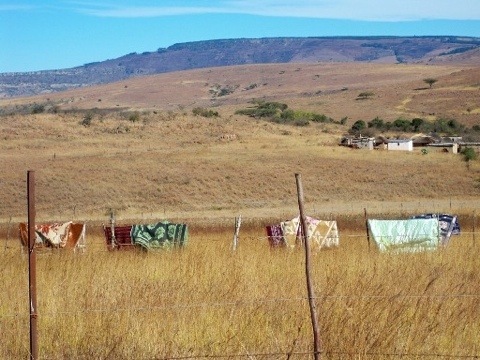 There are 4 dwellings with no running water or electricity, of which one is Salvador’s and Dianne’s and has a bathroom with a toilet and there is also another outside toilet for everybody at the kraal. 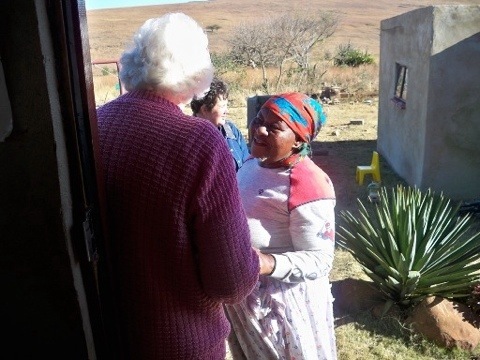 It is important to show respect and politeness by greeting Gogo on arrival, as it is her hospitality as well that has been extended to visit the kraal. She was delighted to see us again and especially to meet Lilian, another gogo. Kim and Johnny, Craig and Magda each provided a caravan to house the overflow of visitors. 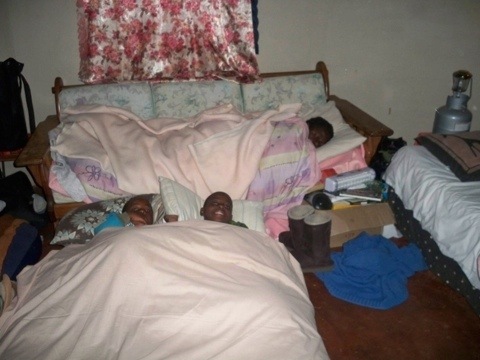 Salvador and Dianne slept in one and Walter, Thabo and Ernest slept in the other one. Lilian and Lizzie slept in Salvador and Dianne’s hut, Thoko and Rosie in a room in Phumulani and Thabi’s hut and I slept in a room alongside Gogo’s hut with Ruth and the 4 younger children. Having got ourselves all sorted out including a quick walk down to the stream, up the hillside and back again we were back in the cars to drive up to Kim and Johnny’s farm for supper and bible study. There we met Girlie for the first time, who is also part of the bible study and she graciously gave us plenty of fresh bread from their bakery. What a precious evening of fellowship we had together. Salvador and Ernest on guitar with Lizzie accompanying on the flute, Phumulani sharing breaking of bread with us, a lovely dinner prepared by all the ladies and a talk from Salvador from the book of Romans with some response from those who had some contribution to add to what Salvador had shared. I must interject here and say that we had the most wonderful weather for that time of the year. The skies were clear and it was not bitterly cold at all. The mornings were crisp but on 2 days the wind was quite warm. One morning I was up at 4 o’clock, sitting on the steps of Salvador and Dianne’s hut gazing at the myriad of stars in the night sky. They seemed close enough to pluck from the sky with my hand. The stillness and beauty of the night sky was amazing. How great is our God. The next morning after breakfast found us back at the farm for a day of fellowship and delicious food with Kim, Johnny and their 3 boys. Olaff, Charnel and their little boy Nathan came up from Piet Retief and we were so glad to see them again. We met Belinda, her daughter and 2 boys and some of their friends as well as Magda and her 2 boys for the first time. They fellowship at the local Baptist church in Vryheid and are very good friends of Salvador and Dianne and they have been such a wonderful support and blessing to them. Everybody went to such lengths to make the day special, especially Kim. She has a lovely home and is incredibly creative and with her love for the Lord she expresses it beautifully. Besides enjoying the incredible scenery and the farm itself Kim arranged fishing at the dam which is on a plateau on top of a mountain on their property, seeing the chickens, feeding the lambs and art activities for those who were interested. Kim gave me lots of plants from her lovely garden and some invaluable advice regarding a question about some artwork I’d like to do one day. Kim’s art is very inspiring. Johnny gave Ernest, Ruth and Big Themba some tennis tips as they’ve just recently started playing at a local tennis club. Interspersed throughout the day was stimulating and interesting conversation. The day ended with Salvador sharing a talk from the book of Haggai, encouraging us to be faithful and to build God’s church to His glory were we find ourselves. As a very small token of our gratitude to everyone’s hospitality, Thoko and I (mostly Thoko) knitted 9 scarves for all the ladies whom we spent time with during our stay. That evening before bed we had a bible study on the book of Acts chapter 13 in Sal and Di’s hut but I had to leave early as the children wouldn’t go to sleep until I was back in the hut. Asimbonge enthusiastically joined us for the night and dived into bed with the boys and was fast asleep in no time. He was having a joyful time with all his visitors. Our last day began early. We met Girlie and Kim at the gate of Ithala Game Park to finalise arrangements to enter. We travelled in the H1 and the older children with Dianne on the back of the truck. Asimbonge and Celani’s son spent the day with us. For most of the morning and early afternoon we spent driving around the park looking for the animals that have their habitat there. Although we did not see much game, the scenery was spectacular. The sense of infinity when gazing upon the expanse of the scenery around us is something to treasure, where back home in the suburbs most things are at such close quarters. The mountains and valleys are something to marvel at as the glory and evidence of God’s creation declares His Lordship over his handiwork without uttering a word, but clearly proclaiming the Word, our Lord Jesus Christ who has been with Him from the beginning and was present and active at creation. We stopped to picnic and stretch our legs near a wide river and then headed for home at the kraal. We spent the evening around the fire, where we enjoyed a yummy braai, talked, sang and laughed with Salvador and Ernest on guitar and Lizzie on the flute. Gradually one person after the other reluctantly drifted off to bed. During this time God restored, refreshed and strengthened us. The peace and stillness around us, echoed in our hearts. We are so thankful to the Lord for the window of opportunity we had to spend time with our dear friends Salvador and Dianne in their home; for their hospitality and for the tremendous encouragement they bring to our lives. To observe their faithful and most often joyful work for the Lord among the people He has placed them, and to talk with them of all the Lord is doing in their midst. After we left for home Phumulani said to Dianne that we had left a hole behind. What a blessing to have in common, our Lord Jesus Christ and together to be a part of His family. We came bearing gifts in love and we left carrying gifts given in love and the most priceless one, that of fellowship. In no time we have been inundated with the demanding routine many of our days bring, but within our hearts we cherish the memory of our time together and often reminisce about the good times we had together. We thank you friends for your continued love and friendship, so freely and generously given to us.